Drums to fit a player's expression in every genre, style, mood and technique. In the '80s Tama's builders and designers wanted something that transcended trends—and they created Starclassic Maple drums and ignited the thin-shell revolution. They paired Tama's legendary quality with the well-known attack, punch and warmth of maple shells. And now the Exotic Finish line offers beautiful, one-of-a-kind exotic wood exteriors for that extra luxurious touch. 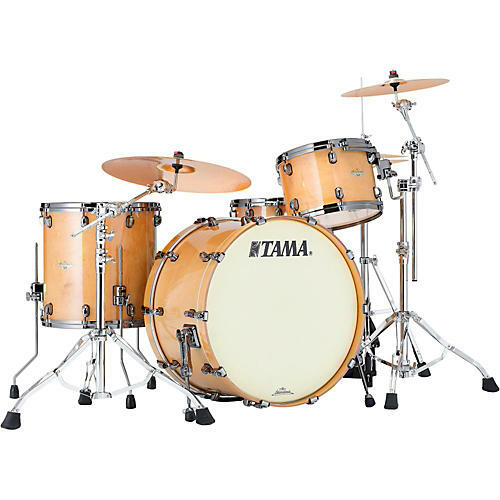 The Star-Cast Mounting System provides maximum resonance and stability for Tama drums. A streamlined design makes it easier to position toms closer together, while a switch to aluminum provides lighter weight and truer tonal vibration. Hoops affect drum tuning and drum sound, which is why Tama uses zinc die-cast hoops, which are manufactured by injecting molten metal into molds. The rest of the drums are fitted with die-cast hoops for consistent tuning, crisper attack and powerful rim shots. Starclassic Maple's claw hooks offer rubber spacers that protect wood hoops from damage. The hooks and hoops work as one unit and won't separate or rattle, even on loose tunings. Tama's MSB30 die-cast bracket holds the spur bracket securely, thanks to the same powerful hinge mechanism used on the MTB30 mounting bracket. Unique memory markers found on the folding spur bracket help simplify set up. Starclassic's Air Pocket rubber feet feature a special air chamber, that eliminates the transfer of vibrations to the floor and absorbs shock for better playing. Evans heads are featured on all Starclassic drums (except bass drum front heads). On the rack and floor toms, Genera G2 2-ply clear batter heads and Genera G1 1-ply clear bottom heads provide both durability and solid sound. Starclassic bass drums are fitted with Genera EQ4 clear batter heads. Cymbals, hardware and snare sold separately. Discover the warm, inviting tones of the original Starclassic. Order today.